What can I say about this lovely little dip? Perhaps that it is thick and very well-behaved at a party, so you don't have to worry about it dripping off your chip and on to your new acquaintance's shoes? Perhaps that you can make it ahead of time, pull it out of the fridge, swirl in some cilantro and you're good to go? Perhaps that it's full of Gouda cheese and I can't think of another cheese that I like better in a dip? Now, I hope that is enough information to help you make an informed decision. 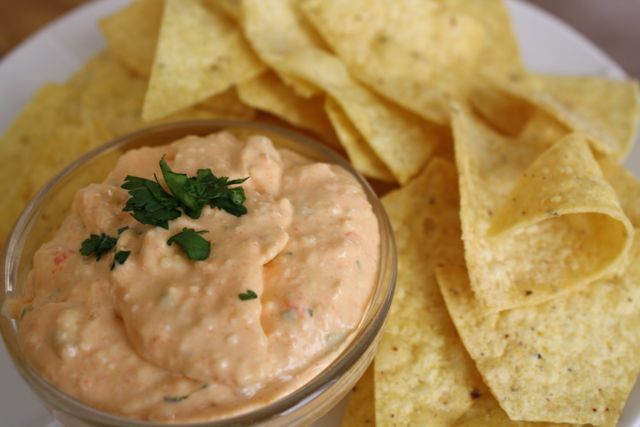 To dip or not to dip? I will just add a few notes. Finally, you may be a sucker for hot dips. 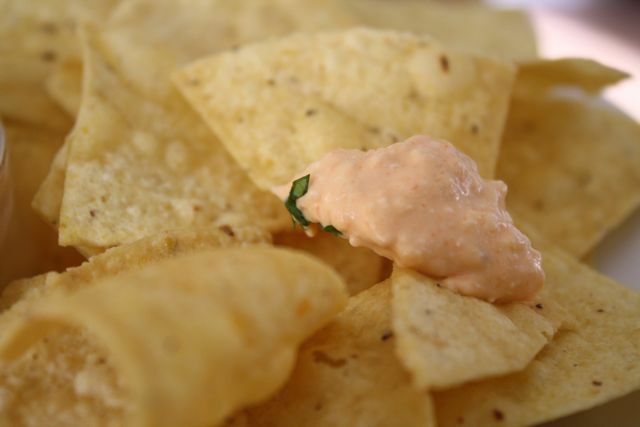 You may think you live for a chip covered in gooey cheesy hot dip goodness. 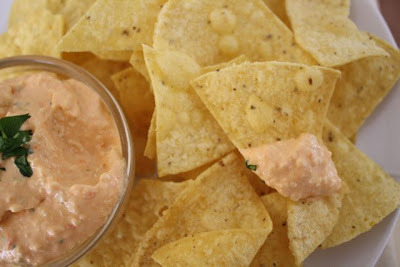 But, people, some dips are better cold. Some dips may have a hot dip option, but are still best cold. This is one of those dips. I know you like options, so I leave it for you to decide. Preheat your oven to 425 degrees Fahrenheit. Put the pieces of red pepper in/on an oven-safe dish and into the oven. Roast for about 15 minutes, until the pepper is a little wrinkly and looks like it's roasted. Remove from the oven and let cool. 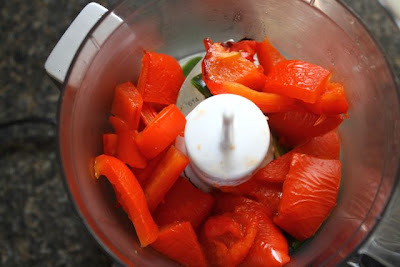 Once the red pepper is cool, take off the skin if it seems easy. If it doesn't, don't worry about it. Chop it roughly and put it in the food processor with the jalapeño. 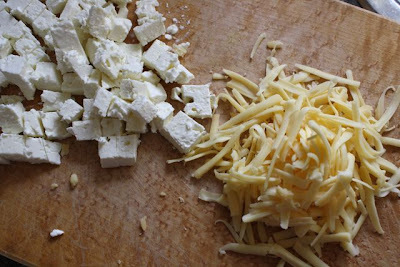 Throw on the Gouda, sour cream and feta. 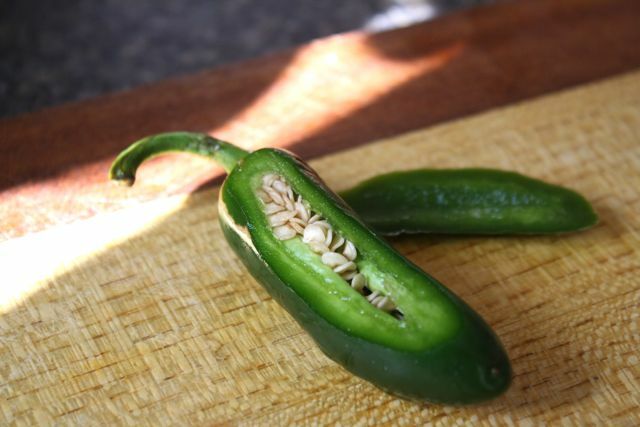 Whirl until the pepper is as fine as you would like it. You may stir in the cilantro (saving a bit to garnish) and serve right away. If you'd like to wait up to two days, store it in the fridge, bring it to room temperature, and stir in the cilantro just before serving. 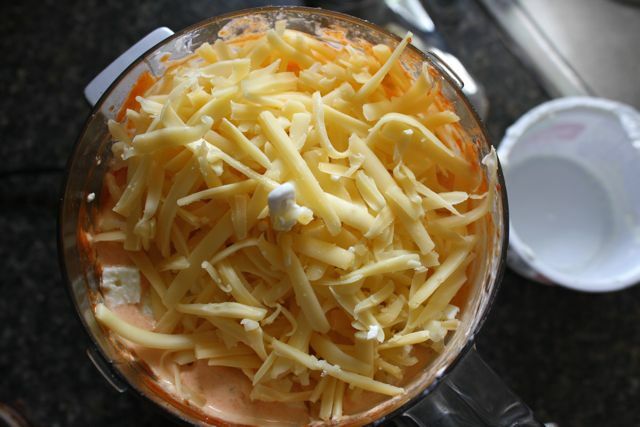 Replace the sour cream with 1 c. (250 g.) regular cream cheese. Bake uncovered at 400 degrees Fahrenheit until it's hot and starts to brown, about 10 – 15 minutes. Garnish with cilantro before serving. Serve with toasted baguette or pita triangles. Just made this, thanks to plentiful and cheap Gouda here in Germany! We're pairing it with (don't say anything, Stephanie) your carrot and fennel soup - on this sunny and thundery and rainy evening it sounded just perfect to us : ) Thanks.